Eko Luxe is a two ply cotton Low twist towel made with 60% Combed organic cotton blended with 40% bamboo fibers. Certified by the Global Organic Textile Standards and using Oeko-Tex certified dyes this is a truely environmentally living product. Very well made and will look great in your bathroom. 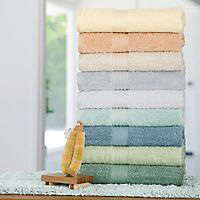 With the cotton bamboo blend and the low twist spinning of the yarns these towels are very absorbent and yet have an excellent feel and softness. 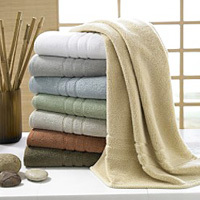 It has the antibacterial properties of the bamboo to reduce odors and mildew to keep the towels fresh. 700 GSM is an excellent weight. Sizes: Bath 30 x 56, Hand 18 x 30 Wash 13 x 13. Specially woven and treated to disperse moisture more evenly for quicker evaporation of the moisture. 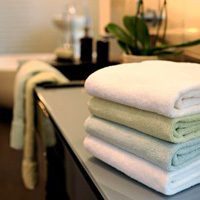 These towels are designed to dry on the towel bar quicker and give you a fresh towel every monring. They also will dry quicker in your automatic dryer saving you engery cost. Test show this towel will dry 33% faster than traditional towels. Made with US Supima combed cotton for softness. 8 colors available. 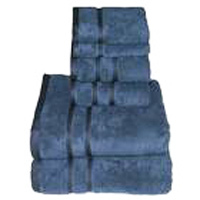 Sizes: Bath 30 x 56, Large Hand 19 x 30, Wash 13 x 13, Bath Sheet 36 x 70 and Tub Mat 22 x 35. 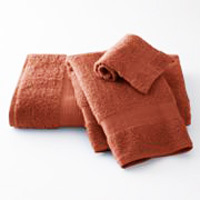 Charisma is one of the finest names in quality towels and this Egyptian cotton towel lives up to the reputation. With a Jacquard scroll border and finely finished end hem the towel will perform for many years and give the luxury you expect. 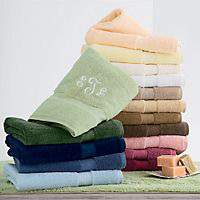 Available in 16 colors and European sizes you will be happy to use this towel everyday. Sizes: Bath 30 x 58, Large Hand 20 x 30, Wash 13 x 13, Bath Sheet 35 x 75 and Tub Mat 24 x 36. A blend of 70% bamboo fibers and 30% cotton this soft and silky towel will stay fresh on your towel bar becasue of the natural antibacterial properties of the bamboo. Reduces mildew and odors and resists bacteria. A soft color pallette of 9 shades with European sizes. Sizes: Bath 30 x 54, Large Hand 20 x 30, Wash 13 x 13, Bath Sheet 39 x 68 and Tub Mat 22 x 35. 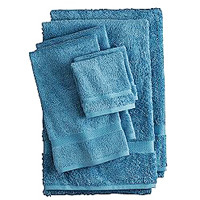 Martex Luxor towel cottection hs been a mainstay in every top department store for decades. Consistant quality in an traditional American look and feel of a towel. the loops are standing up to give a bulky and thick appearance. Made with Egyptian cotton in single ply loops. 7 colors to choose from. Sizes: Bath 30 x 56, Hand 16 x 28 and Wash 13 x 13. The Supreme Egyptian cotton towel is made with 2 ply yarns in a dense and tightly woven surface that will dry any one in record time. The 2 ply yarns are very strong and will last almost a liftime. Very thick and absorbent this is not a towelf for the light weight. But if you want a long lasting and beautiful looking towel this is the one. The 800 GSM weight is about a heavy of towel as you will ever need. 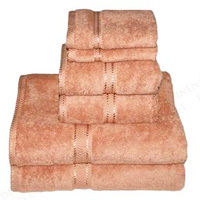 Sizes: Bath 30 x 54, Large Hand 20 x 30, Wash 12 x 12 and Bath Sheet 35 x 66. The Nautica J Class towel uses a high performance hollow core yarns which make the towel loftier and more absorbent. This technique is called Hydro Cotton and is one of the newest yarn spinning advancments. Very Absorbent and soft this is one of the newest types of towels in the maket. Available in 8 colors. Sizes: Bath 30 x 54, Hand 16 x 28, Wash 13 x 13, Bath Sheet 36 x 66 and Tub Mat 20 x 30. Soft, luxurious and eco-friendly at the same time is difficult to fine. The Organika towel is made with 100% Skal certified organic cotton and dyed with Ecotex certified chemically free dyes. It is plush and very absorbent. The 625 GSM weight is perfect. Available in 8 contemporary colors. Sizes: Bath 28 x 58, Hand 16 x 26, Wash 12 x 12, Bath Sheet 34 x 66 and Tub Mat 20 x 34. The Christy Renaissance towel is the classic European soft and luxurious towel you have seen before. Becasue Christy began making this towel decades ago and it keeps its great features today. Using single ply yarns spun very fine with Soft Egyptian yarns. Then using extra long loops for increase the softness. 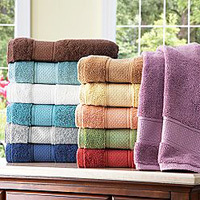 With the great reputation of long lasting towels from Christy you will be purchasing a heirloom. Everyone will notice the quality of this towel in you home. available in 18 superior colors. 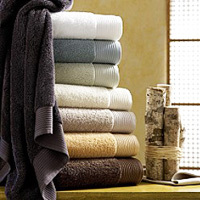 Sizes: Bath 30 x 54, Hand 16 x 30, Wash 13 x 13, Bath Sheet 35 x 65 and Tub Mat 22 x 35. The Coshmere towel by Schlossberg of Switzerland is made with the finest grade of American Supima cotton. Using a patented spinning process which allows weaving without any use of chemicals is unique. Creating a Eco friendly product that is still has the sensual feel of genuine cashmere. In 16 rich contempory colors and European sizes. 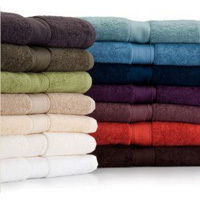 Sizes: Bath 27 x 55, Large Hand 19 x 35, Wash 13 x 13, Bath Sheet 39 x 59 and Guest 13 x 25.